Avon has launched 4 new shades to the Color Trend range, a selection of plum, pink and orange shades. 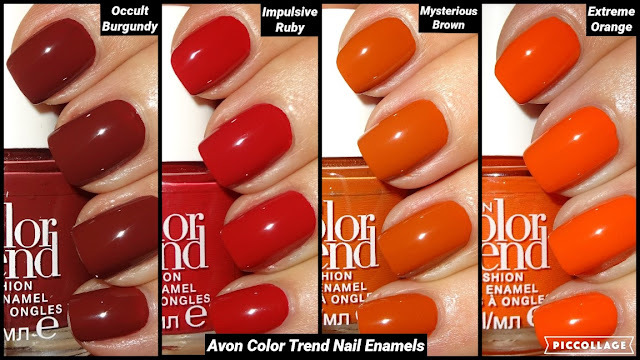 I don't know why Avon have waited until now to release them, these shades are perfect for Autumn, but really you can wear whatever colour you like, whenever you like. The Color Trend range is Avon's budget-friendly collection, usually priced at £1.50 for an 8ml bottle. The formulation is superb and very well pigmented, super nail enamels at a bargain price, I highly recommend these shades. Onto the photos. The camera flash has lightened the shades, see my video at the bottom which gives a better representation of the shades. All manis are 2 coats without top coats to show you how glossy they are, however, I always recommend a top coat. Love these colours, don't mind spending £1.50 for a little bottle!